THE HAGUE - The Netherlands is seeking to set up an overseas abortion fund to counteract Donald Trump’s recent ban against funding international groups which give women information about terminations. Minister for Foreign Trade and Development Cooperation Lilianne Ploumen for the Dutch government has announced she intends to establish an international fund which would finance projects relating to access for birth control, abortion and women’s education, throughout developing countries. Ms Ploumen announced the plan in reaction to an extensive memorandum signed by Mr Trump to restrict access to information on abortion for women who are in receipt of aid from international development groups. 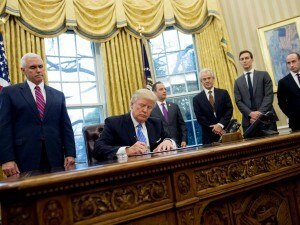 Known as the Mexico City Policy and also as ‘the global gag rule’, the ban was one of Mr Trump’s first actions upon entering office last week. It prohibits US funding for any international aid groups which give women information about abortion, even if they do not perform the procedures. She also quoted figures from Marie Stopes International, one group which would lose funding under the initiative, suggesting up to 14 women a day could die as a result of the gag. The Mexico City Policy is a traditional tool used by Republican administrations and is frequently put in place under GOP presidents, before being rescinded by Democratic ones. It was last put in place under George W Bush and then subsequently repealed by Barrack Obama when he entered office. The policy has been criticised by many women’s rights and healthcare groups who fear the lives of women and girls may be put at risk by the policy, either due to continuing risky pregnancies or attempting to perform terminations dangerously. However, many Republican politicians support the policy for religious reasons.